Indexing cold foil delivers up to 82% in foil savings. Indexing reduces press down time with fewer roll changes. Ability to use multiple narrow webs of foil at the same time. Features heavy duty, segmented 6″ shafts that hold up to 15,000 meter rolls. Move-Web technology using Siemens S-7 Platform with Si-Motion Controller and DGM proprietary software. Exclusive Impression Security System that protects the print cylinder. Auto Micro adjust web tension system that gives you perfect DGM foil laydown on the sheet. Quick and easy job set-up of foil rolls. Foildex Systems can also perform UV Cast and Cure. 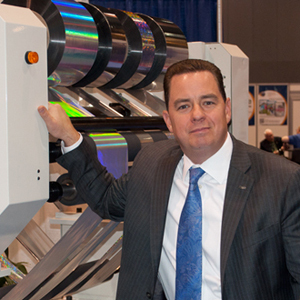 Indexing Cold Foil Technology is designed to work with almost any existing printing press. This Foildex is shown atop a Heidelberg Press. Why Settle for a Non-Indexing Machine? The most expensive part of cold foil printing is the cold foil itself. DGM Foildex Technology replaces older cold foil systems which use the equivlent of the circumference of the blanket cylinder, about 37″ for each sheet that passes through the press, irrespective of the amount of foil needed for that particular job. Reducing cold foil waste also has a significant environmental impact on an already fully recyclable product. The Diversified Graphic Machinery Cold Foil System uses a Single Tower Technology. In the first print unit a Cold Foil Adhesive is applied through the inking station with a standard litho plate onto the substrate. 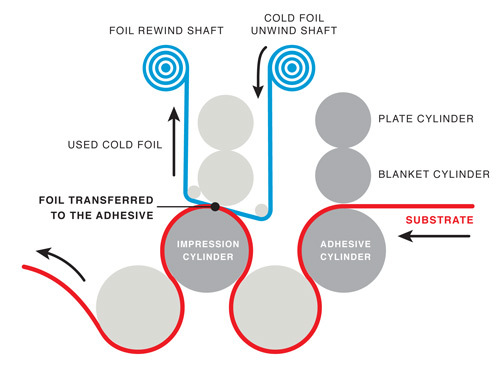 The Cold Foil Adhesive can be applied as a spot or flood effect onto the entire sheet as the foil is only released onto the substrate where the ink based adhesive has been applied. 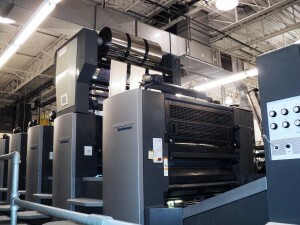 The second print unit is the actual Cold Foil Application unit where the foil is applies onto the substrate and rewound. After the foil has been applied, the remaining printing units apply CMYK and spot colors resulting in a brilliant foil effect. Converting back and forth between normal printing and Cold Foil applications is as simple as washing down the adhesive and re-inking the unit. Since 2000, Diversified Graphic Machinery has introduced high performance machinery and innovative specialty print finishing solutions to give our customers a competitive advantage in the marketplace. DGM Foildex in-line Cold Foil Technology not only provides perfect foil laydown but also delivers substantial savings in both foil usage and and overall production costs. 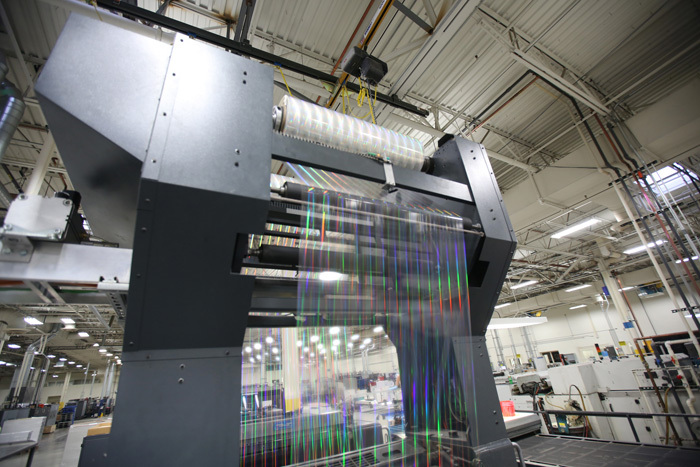 We are extremely proud of the fact that DGM Foildex is the technological innovation that has dramatically changed our industry.